The Redskins were in a new location, and had a highly-touted rookie passing tailback debuting as well, as they hosted the New York Giants for their season-opening game on September 16, 1937. After five years in Boston, owner George Preston Marshall had shifted the franchise to Washington in the offseason. Coached by Ray Flaherty, the Redskins topped the Eastern Division the previous year and retained some outstanding talent in FB Cliff Battles, ends Wayne Millner and Charley Malone, and tackle Turk Edwards. To the mix was being added tailback Sammy Baugh (pictured at right). 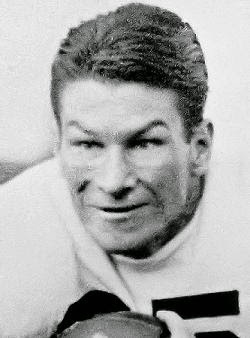 Baugh was a consensus All-American at Texas Christian and the Redskins made him their first draft choice for the ’37 season. He had agreed to a contract a week before taking the field against the Giants. Ever the promoter, owner Marshall had the Texas native arrive in Washington wearing a ten gallon hat and cowboy boots, which were not his usual attire. But the 6’2”, 180-pound Baugh brought a strong and accurate throwing arm, something the club had been lacking, plus a variety of other skills. The Giants were coming off of a 5-6-1 record in 1936, their first losing season after winning three consecutive Eastern Division titles and one NFL Championship. Head Coach Steve Owen’s team was rebuilding with many rookies on the roster but also had established stars such as C/LB Mel Hein, QB Ed Danowski, and FB Tuffy Leemans. There were 24,942 fans in attendance for the Thursday night game at Griffith Stadium. In the first quarter, Baugh excited the crowd with a hard-thrown pass to wingback Ernie Pinckert. The Redskins, who were without the injured Cliff Battles, put together the first scoring drive of the contest, advancing 70 yards to a 19-yard field goal by Riley Smith. New York twice drove into scoring territory in the second quarter, but the Giants were stopped at the Washington 12 the first time and then at the one foot line. Taldon “Tilly” Manton missed a field goal try from 30 yards but was successful on another from 13 yards that tied the score. That was it until the fourth quarter, when Smith intercepted a Jim Neill pass and returned it 58 yards for a touchdown. He also added the extra point. Shortly thereafter, Baugh passed the Redskins into New York territory and, when the drive stalled, Smith kicked an 18-yard field goal to seal the 13-3 win. The Giants outgained Washington by 311 yards to 221 and also had more first downs (17 to 15). Each team turned the ball over twice, although one of New York’s led directly to a score. Sammy Baugh, who played a full sixty minutes, completed 11 of 16 passes for 115 yards, with completions to Charlie Malone, Ernie Pinckert, and end Bob McChesney. Riley Smith (pictured below) accounted for all of Washington’s points with his interception return touchdown, two field goals, and extra point. For the Giants, Ed Danowski was successful on 6 of 11 throws for 69 yards. Tuffy Leemans injured his ankle in the second quarter, but still gained a total of 72 yards to lead both teams. Following a 2-2 start, the Redskins went on to lose only one more game and demolished the Giants in New York in the final week to win the Eastern Division with an 8-3 record. They defeated the Bears for the NFL Championship. New York placed second in the division at 6-3-2. 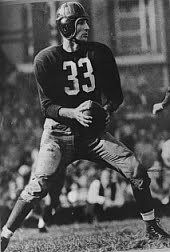 Sammy Baugh set a NFL record with 81 pass completions and led the league by throwing for 1127 yards. To cap his outstanding first season, he passed for 335 yards and three touchdowns in the title game against Chicago. He would go on to play 16 seasons in the NFL, switching from single-wing tailback to T-formation quarterback at mid-career, and owned most of the league’s passing records by the end while also excelling as a safety on defense and punter. Baugh would ultimately be enshrined in the Pro Football Hall of Fame as a charter member in 1963.